The results reported here were gathered through telephone interviews conducted by Princeton Survey Research Associates for the Pew Internet & American Life Project between October 26 and November 28, 2004, among a sample of 1,100 parent-child pairs. Teens in these surveys are young people between the ages of 12 and 17. For results based on the total parent or teen sample, one can say with 95% confidence that the error attributable to sampling and other random effects is +/- 3%. For results based on online teens or online parents, margin of sampling error is +/- 4%. For a growing portion of the online teen population, schools have become an important venue for internet use for a significant number of teens. About one in five online teens (18%) who use the internet from multiple locations list school as the location where they go online most often. This figure is up from 11% in December 2000. Interestingly, less than 1% of online teenagers who go online from school say that school is their only location of access. This means that while many teenagers do go online at school, very few rely exclusively on their school’s internet connections. These teens find additional locations outside of school to connect online, even if they are not wired at their own home. 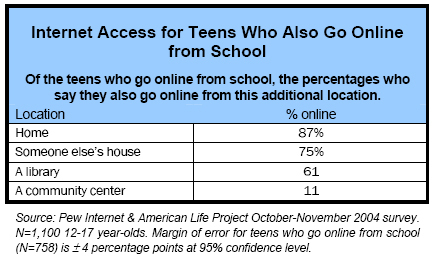 For the teenagers who reported that they go online at school (N=758), 87% also go online from their home, 75% go online from someone else’s house, 61% go online from a library, and 11% from a community center of some kind. Just 13% of teens who connect to the web from school do not also have web access at their home. These teens tend to be online much less often than all online teens who have access from home and school. Twenty-eight percent of teens who go online at home and school report going online several times a day and 28% go online about once a day. Of the teens who go online at school and not from home, only 7% say they go online several times a day and 15% say they go online about once a day. While school can be a location that allows teens to get access to the web when they do not have access as readily elsewhere, those teens with online access at home are able to go online much more frequently. Of all the teens who do not go online at school, either because they do not go online at all or they go online elsewhere (N=342), 23% live in a household with an income of less than $30,000 per year while 31% live in a household with an income of $75,000 or greater. This would suggest that the reason that some teens do not go online at school is not necessarily economic. Perhaps these teens choose not to go online at school because their school’s access is inconvenient due to old machines, filtering, or limited availability of computers. There is agreement among teens and their parents about the role that the internet plays in teens’ education. Eighty-six percent of teens, and 88% of online teens, believe that the internet helps teenagers to do better in school. Eighty percent of parents and 83% of parents of online teens agreed with that proposition. There is more of a disagreement when it comes to use of the internet for cheating on schoolwork. Some 37% of teens said that “too many” teens today use the internet to cheat on schoolwork. That compares to 27% of parents who say the same thing. In December 2000, 18% of teens said that they knew someone who had used the internet to cheat on schoolwork. Notably, in our recent survey there is practically no difference between teens who are online and those who are not as to whether they believe too many teens cheat using the web. There is an even more substantial difference in opinion between parents and teenagers about the need for children to use the web by the time they have started school. One-quarter of teenagers agreed that if a child is not using the internet by the time they start school, they will fall behind their peers while 44% of parents believed the same thing. While most parents and teens view the internet as a helpful academic tool, parents are more likely to believe that children must be familiar with the web by the time they start school. Three-quarters of online teens use instant messaging – that represents close to 16 million youth. Of those 16 million, 78% say they use IM from time to time to talk about homework, tests or schoolwork. Online girls are more likely than online boys to do this, and older girls (those ages 15-17) are the most likely of all to do this. Teens with broadband connections at home are more likely than dial-up internet users to use IM this way. The internet is a common tool that many teens use to search for information on colleges or other schools. Fifty-seven percent of online teens have gone online to get information about a college, university, or other school they were thinking about attending. Our November 2004 survey of adults showed that 45% of online adults have done the same thing. Among teens, girls are more likely to search for schools on the internet than boys, 61% to 53%. The likelihood that a teenager has searched online for school information increases with age. About a quarter (27%) of 12-year-old internet users have done this, compared with 85% of 17-year-old internet users. There is no significant difference between the percentages of teens who have looked for such information with dial-up connections and those with broadband connections.